Alfred von Tirpitz, architect of Germany’s High Seas Fleet, came up through the officer ranks as a cruiser deck officer, commander and finally squadron commander. Though better remembered for his obsession with battleships as State Secretary for the Imperial Navy (equivalent of other nations’ Navy Minister), Tirpitz also supported a constant program of cruiser construction, so long as a funding stream separate from that for the battleships paid the bills. The cruiser force faced a shortage of hulls during the years before the Great War, as Tirpitz declared battle cruisers to be “great cruisers,” just like the preceding armored cruisers, and funded them under that label. But he always intended the battle cruisers to serve with the High Seas Fleet, and never on overseas stations. That shifted the burden more and more to the light cruisers, known to the Germans as “small cruisers,” and the aging armored cruisers left over from the pre-dreadnought era. Yet cruiser construction did not keep up with the needs of the expanding fleet and ongoing commitment to foreign stations. Much of this had to do with soaring costs of ever-larger capital ships; battle cruiser Von der Tann, laid down in 1908, cost 36.5 million gold marks while the four light cruisers laid down that year cost 32.6 million gold marks for the entire class. By 1912, the cost of the newly-laid-down Derfflinger had risen to 56 million gold marks, while the light cruiser class laid down that year (two ships of the Graudenz class) had remained fairly constant at 8.8 million gold marks. Given the choice, Tirpitz preferred one Derfflinger to six or seven Graudenzes. Not until the outbreak of the First World War did the High seas Fleet address its relative shortage of cruisers, laying down 16 hulls between 1914 and 1916 – two fast minelaying cruisers and 14 slightly improved repeats of the last pre-war design (itself a class of only two ships). As the German Admiralty met to discuss new warship types, they gave most of their attention to heavy warships, but found time to study a new light cruiser as well. The debate over a new cruiser centered on whether the Navy should build one multi-purpose type, or separate colonial cruisers and fleet cruisers. The fleet cruisers would be smaller, faster, and heavily-armed for their size (five 150mm guns and four torpedo tubes); Kaiser Wilhelm II personally requested such a proposal, modeled on the Royal Navy’s C-class small cruisers. The bigger cruisers followed the same basic layout as the last class of light cruisers, displacing up to twice as much as the smaller designs but offering greater range and more guns for the larger variants. They would remain dual-purpose ships, suitable for service in the Navy’s far-flung colonial squadrons but also with the High Seas Fleet’s scouting forces. Most of the extra space went for better crew accommodations; sailors serving aboard the smaller cruisers would live on barracks ashore when the High Seas Fleet was not actually at sea. The bigger cruisers would also, of course, cost more than the small ship. The admirals also looked at variations of the larger light cruisers armed with heavier guns, 170mm (6.7-inch) guns and the excellent 210mm (8.2-inch) SK L/45 rifle that armed the ill-fated armored cruiser Blücher and the fast armored cruiser proposed by Vice Admiral Georg Hebbinghaus. While the 210mm gun might seem an overly large weapon for a light cruiser, the British certainly feared that such a ship was under construction and ordered the Hawkins class cruisers to counter it. At 170 meters the cruiser designed to carry the weapon was longer than Blücher though considerably narrower, and the big guns would have been placed in shielded single mounts rather than turrets, with four such weapons all along the centerline (in place of eight 150mm guns). These proposals appear to have had little support; the admirals preferred keeping a uniform main armament across their cruiser force. Both the fleet cruiser and the larger cruiser would have nominal deck and belt armor, little changed from previous classes. The bigger ship could make 31 knots and the smaller one 33 knots (though a variation on the design made 30 knots at a considerable decrease in horsepower); all of the designs featured dual coal- and oil-burning power plants and turbines. All of the design variants carried four above-water torpedo tubes in trainable deck mounts; some had four single mounts and others two dual mounts. Unusually for German cruiser designs, most of the proposals were not fitted for minelaying. Both cruisers represented an upgrade over the previous Cöln class, which could only make 25 knots. The Cöln class had exactly double the estimated range of the new, smaller fleet cruiser and a heavier gun armament, but like other German light cruisers could not operate alongside German destroyers without slowing them down. The new ship gave the Scouting Forces a cruiser that could accompany the destroyers into battle and lend them her heavier gunnery support. The mission requirement for the larger ship is less clear; she had the speed of her smaller cousin but the heavier rate of fire afforded by more, smaller main guns would have been more useful to the Scouting Forces than the bigger guns despite their much greater effective range. The big guns would have been useful for engaging enemy cruisers outside their own envelope, but the fast armored cruiser proposed by Hebbinghaus would have filled that role far more effectively. This would have come at a much greater cost, but the admirals don’t seem to have been overly concerned about the taxpayers’ gold marks. 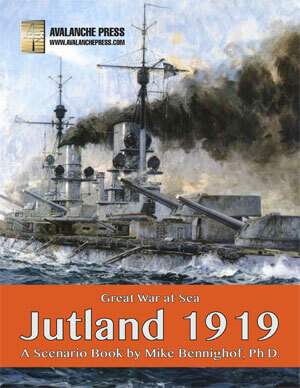 Our Jutland 1919 expansion book includes two examples of the small fleet cruiser and three of the larger ship with 210mm guns. The small cruiser design has appeared before, in our out-of-print U.S. Navy Plan Gold in the colors of the Weimar Republic; we’ve given her a nicer drawing and of course put her in the livery of the High Seas Fleet. The bigger cruiser received little attention during the discussions, as the admirals immediately realized her limited usefulness, but she makes for an interesting game piece so we included her in the book. We also included the last three units of the Cöln class; these were laid down a year after their sisters and never received names. The other seven ships of the class appear in Jutland, so it seemed a good thing to round out the class.